Everyone has good and bad days at work and Pappagallo’s Satellite Beach is no exception. I don’t know how most restaurant owners gauge a good day vs bad, for me it’s not about how much we sold it’s more about how we smooth things went while we sold it. Pappagallo’s Satellite Beach has had our fair share of days that make we wonder if I’ve made the right career choice. Most of those days are due to mistakes we’ve made with particular orders or hurricanes that knock us out of business, or something that just makes me feel like I’m the only one that has to deal with whatever catastrophe has just occurred. I’m being more than a little dramatic and luckily those days are few and far between. I can’t remember even one day in the last 28 years when I didn’t get at least a few good laughs out of something that happened at work. This past Sunday was the definition of a good day. No real specific reason, it was just one of those days that reminded me why working so much never seems like too much. The day started normally, get there a few hours before we open and get your opening prep going to be ready for a productive day. Pappagallo’s Satellite Beach did try something a little different than normal on this day, we booked a former staff member to come in and provide some live music outside on the patio. 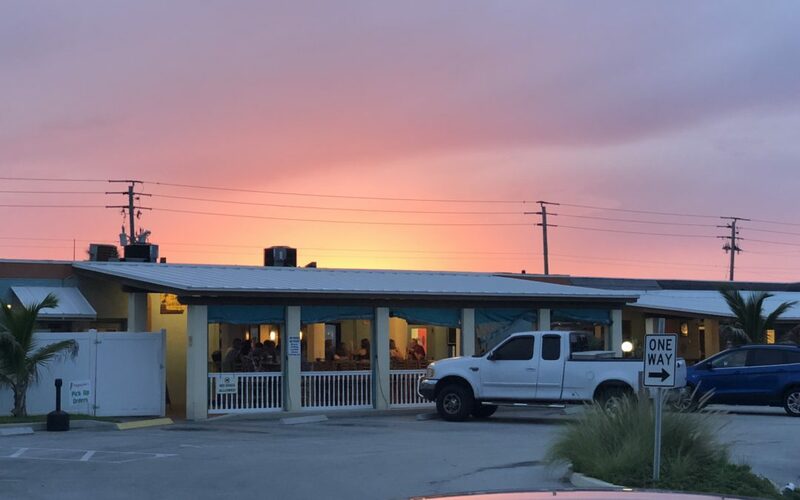 Pappagallo’s Satellite Beach announced this mini-event across our social media pages as well as by word of mouth during the week before Sunday. Most people seemed to be excited so we expected a decent turn out, and had some extra staff coverage and got ready for a good Sunday night. Here’s the thing about most sundays, I usually work that day because it’s the day that is most likely to have something crazy happen. Family birthdays and other social celebrations seem to happen on sundays so sometimes it’s a challenge to get enough staff in their proper stations. Sunday is my favorite day of the week to work for several selfish reasons. See sunday, I’m not interrupted by salespeople coming in at the wrong time trying to sell us stuff we didn’t ask for and most likely don’t need. In short I get to do what I really like to do most and that is I get to actually cook. Sunday is also the day, at least for summer, that both of my kids work with me. Krista (my daughter) goes back to college soon. Nik (my son) alternates his Sunday with some other bartenders so he can have some time for his social life as well. So this past Sunday both of my natural born kids were at work as well as some long time staff members who really do a great job! The other staff members that were working were very strong in their respective positions. This situation left me little to worry about and gave me a chance to see how far Pappagallo’s Satellite Beach has come. We started 28 years ago as a 5 booth hole in the wall with one employee. Fast forward to today’s version of Pappagallo’s Satellite Beach that seats 152 people has 40-50 employees and serves appetizers through full liquor bar. I have to admit sometimes I do stand back like a proud “Papa” (no pun intended) and look back with pride on how far we’ve come. On this day I looked back to see some of the people that I have had the privilege of working with, some years and a couple literally since birth. Pappagallites were on top of their game on this night. We were very busy but you would have never known it. Everyone was smiling and having a great time, yes some people can actually love their job, it was evident on this night. The live music added a different atmosphere, set by a musician that used to work with us but left to pursue his passion for music. I always hate to say goodbye to one of my “kids” but always thrilled to see them succeed in what they love. Tori- a young lady that has only recently started with us. She’s a little quiet but really hustles and really goes out of her way to keep her guests happy and when she smiles everyone around her smiles as well. Laura -has been with us a few months but has a lot of serving experience and a great disposition and a outstanding understanding of what teamwork is about. Laura is a huge help whenever she’s working. Brianna- has been with us for a while now and I’m always having to remind myself that’s she just recently turned 18. Brianna works in every position in front of house and sometimes when I look up it’s hard to tell what she’s actually on the schedule for that night because she’s everywhere helping everybody. My only hesitation in giving her more credit and praise is that I know she’ll hold it over my head later. All kidding aside she’s a great kid who I know will do great things in whatever field she chooses. Krista- well she’s my daughter so we know she’s perfect, but there was a time that it would’ve been obvious that she was the “bosses daughter,” boy has that changed. Krista, along with her brother Nik, control most of our social media presence. Krista has become an excellent server in her own rite. I find it cute and admirable that she doesn’t tell her guests that she is the owners daughter unless they ask her directly. Peanut- he was our food runner and busser that night. Peanut has super high energy and can absolute blast to watch work. You know he’s working because the rest of the staff is laughing just watching and listening to his antics. Alexis- was our hostess, she’s been with us for a while now and this is her first ever job. I had to confess that when she first started I didn’t think the restaurant life was for her. I’m happy to admit I was wrong! She’s another one that has a smile that lights up the room and she has a great handle on doing her job. Continued on the next blog….